When it comes to software development, speed is the critical ingredient for success. If you plan for speed carefully enough, cost and quality will come along for the ride. So says Mirco Hering, a managing director of Accenture's Agile and DevOps practice. 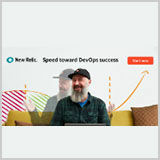 And that's just one of the enterprise DevOps insights Mirco shares with New Relic hosts Tori Wieldt and Fredric Paul in the latest episode of the New Relic Modern Software Podcast. As a highly versatile platform, GitHub can be deployed as on-premises, SaaS, or a hybrid of both with GitHub Connect.